This post has a very American title but any UK equivalents just don't sound the same. 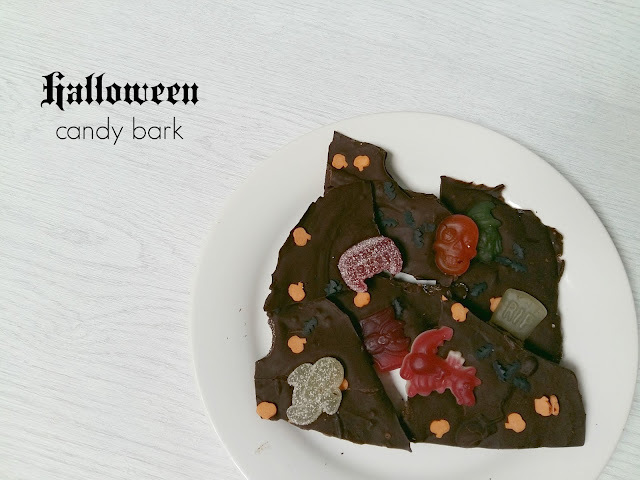 Halloween sweets in chocolate doesn't have quite the same ring to it does it? 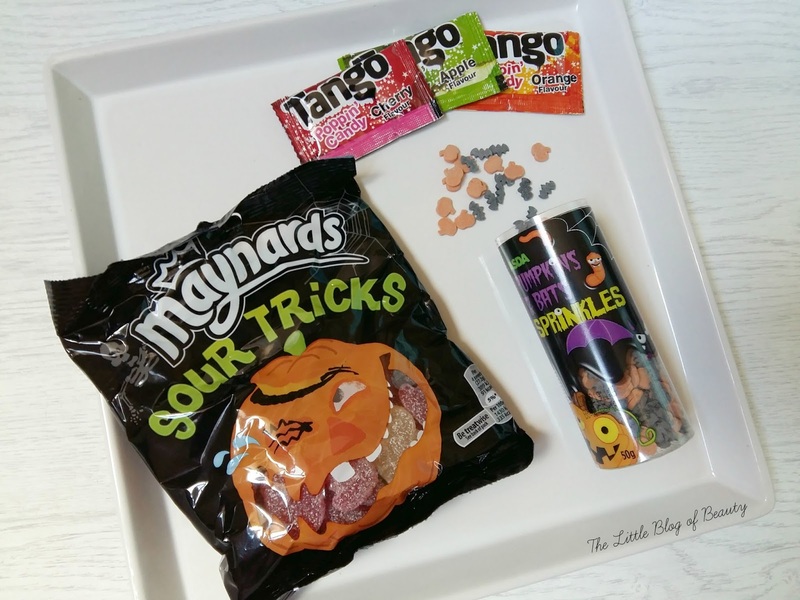 The Maynards set actually contains quite a lot of sweets and I only used around 7 of them, so there's plenty left over for you to eat separately or maybe bag up for Trick or Treating gifts (if you like to give them out). Also, although the Myths and Monsters packs did contain some Halloween appropriate sweets it also contained mermaids and unicorns, which couldn't really be any less Halloween! Start by preparing some kind of dish to pour the melted chocolate in to and line this with some cling film. The cling film means the chocolate doesn't stick to the dish when it sets and can be peeled away from the chocolate. Fill the saucepan with water but make sure this doesn't touch the bottom of the Pyrex bowl. Heat up the water but try not to let it boil if possible so as not to burn the chocolate, simmering water is better. Break the chocolate up into smaller chunks and add a few at a time to the bowl, letting them melt before adding the next ones and stirring all the time. Once melted pour half of the chocolate into the lined bowl and add the popping candy. I used six sachets, two of each flavour. Pour the rest of the chocolate over the top and add whatever sweets you've bought pushing them down slightly into the chocolate, but not so they're covered. Pop in the fridge and wait for it to cool and set. Once set take out of the dish, peel off the cling film and break into rough chunks. 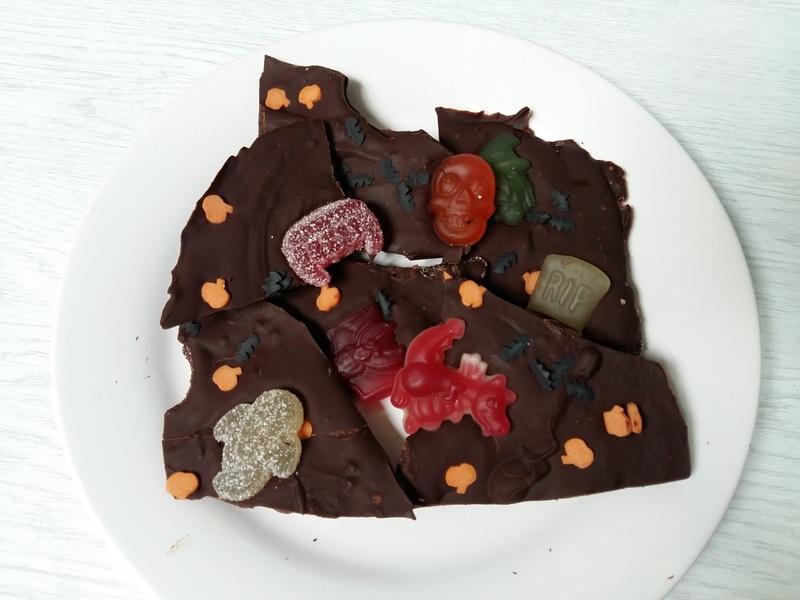 Once finished you can pop this in a box to give as a gift, arrange on some suitably Halloween themed paper plates for a party or just eat it yourself. As I said I'm disappointed I couldn't get the sort of sweets I wanted for this but I'm quite pleased with how it turned out and it tasted amazing. I did stand my tombstone sweet up in the chocolate but when I fetched it from the fridge I was disappointed to find it had fallen over! Will you be making any Halloween treats? This looks so original!! Love it and will give it a try! This is such a cute idea, the problem is I'd want to eat it all myself! I love this it simple but really thoughtful! I may have to steal this recipe to make it!